This season I’ve just picked for myself, not patterns of general interest. There are some marvellous new Vogue designer patterns for people who want to look both stunning and professional. But I’m past that stage of my life. I keep saying this, but I wear big shirts and vests – a look that does appear on the runway and in many stores – though the fashion journalists rarely mention it and the wardrobe planners never do. Happily the pattern companies cater well for my tastes, even if the fashion writers don’t ! Here’s some of the new possibilities. I love a yoked shirt – works well for my personal style and my body shape. The yoke gives a bit of definition to my skimpy shoulders. And the gathers below allow a trim slim look over the shoulders combined with extra fabric to cover my hips. I also prefer a style that closes up to the neck, rather then a V-neck. I feel the cold, it suits my face shape better, and it gives a bit of dimension to the front of a garment – needed as I have a small bust. Here’s a couple of very different styles. 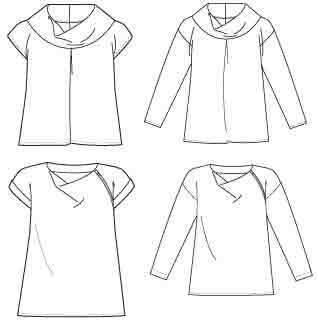 A big loose shirt with choice of 3 necklines, 2 sleeves and 2 hems (similar big yoke at back), McCall’s 6605. Best to wear leggings or slim pants with such a big top, if you don’t want to look like a balloon ! By contrast, here’s a neat slim fit, Butterick 5826. Possible to wear a much wider range of pant leg widths with a closer fitting style like this. 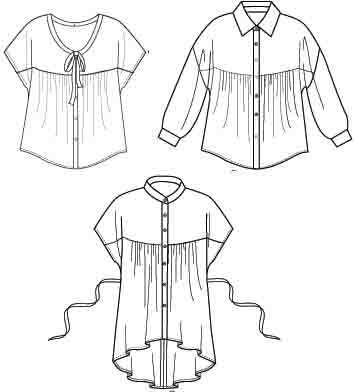 I also like an inset yoke and a smock style, but patterns for those are mainly from Simplicity/ New Look. For wovens – the front of this drape style (left) is cut on the bias, McCall’s 6604. Butterick 5816 has multiple options. 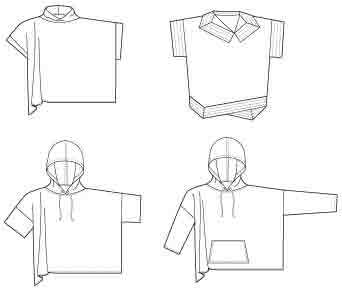 If you like the comfort of big loose tops, here are wide poncho-like styles for indoor wear, 3 necklines including a hoodie, 4 sleeves, 2 hems, McCall’s 6603. An easy-wear extra layer of warmth without encumbering the arms. 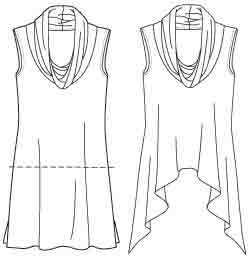 Here’s a fairly conventional vest pattern – ah, no, it has actually got both bust and back neck darts ! Looks spectacular made in fur (and fur gilets are high fashion). Large enough to layer over a fitted jacket, Vogue 8838. Or a deep cowl sleeveless layering knit tunic with 3 hems by Nancy Zieman, McCall’s 6607. Leave off the cowl, add a scarf instead, change neckline/ add collar if you’re adventurous – many easy style changes. Many crafters like the challenge of pieced jackets. Modern ones are made with areas of different tones of similar solid fabrics, rather than myriad small pieces of patterned patchwork fabrics. There’s a multi-fabric option for the jacket with the fur vest, Vogue 8838. The skill involved in making that back will only be appreciated by other sewers ! There’s also a new jacket from Marcy Tilton, Vogue 8839. For knits including fleece. It has a short cascade collar, more flattering for my small busted top. 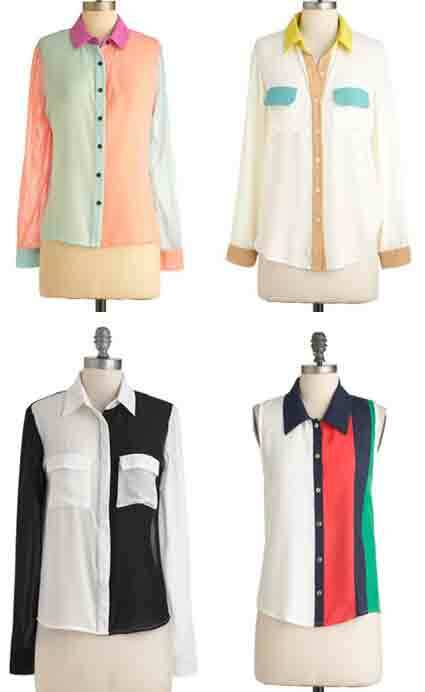 And interesting options for combining fabrics. A bit straight up and down for my shape, I might add some flare. Use your favourite classic shirt pattern, or there’s a new version of the Palmer-Pletsch unisex shirt, McCall’s 6613. And there are multi-fabric options for the Butterick 5816 top. Not pieced (though it could be) : a new pattern for my usual shape of jacket – Connie Crawford Butterick 5828. Or exaggerate the size – Style.com says oversized coats are a big fashion idea for this a/w. I’m a fan of Marcy Tilton bags, this one is Vogue 8843. But what’s with the big green leaf ? 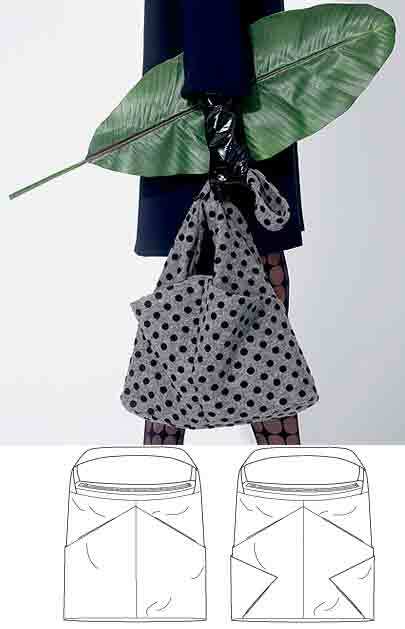 I confess I didn’t notice the bag at first, and thought the pattern was for a leaf shaped bag. Not something to take on the bus in the rush hour ! There are many attractive new pants patterns this season, from very slim to wide. But I only wear one style of pants, simple classics – slightly tapered or slightly more tapered. I haven’t got the right shape legs for leggings, but I do need to look for a slim pair of pants, to have the current proportions with those big tops. Hmmm. . . Palmer-Pletsch McCall’s 6440 is not new but recent. 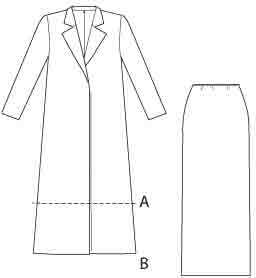 There is a pattern which might entice me back to skirt wearing – a long skirt with matching jacket, Vogue 8841. I could wear this round here without looking odd. Slightly shorter jacket is like the proportions of skirts and jackets in the early 20th century, my favourite historic period for style. This entry was posted on September 15, 2012 at 9:17 am and is filed under current fashion, my choices. You can subscribe via RSS 2.0 feed to this post's comments. Both comments and pings are currently closed. loved this post and now have to get busy with autumn styles! Thank you. Nice to have you back! You have such a sharp eye for shapes. I always appreciate your suggestions. Super choices here, and a few I had overlooked. Funny how someone else’s views gives you a whole new outlook on a pattern and it’s possibilities. So, which ones are you going to work on this season??? Thanks for the comment. My problem is I always love all the styles I pick out (and I’m a great one for thinking uup dozens of must-have ideas whenever I see any inspiration) but I work very slowly 😀 I think my priority this season is to work on some slimmer pants. That would update the look of most of my outfits. The combination of large hips going down to slimmer legs which appear beneath thigh length tops. . . Especially when I am only 5′ 2″.